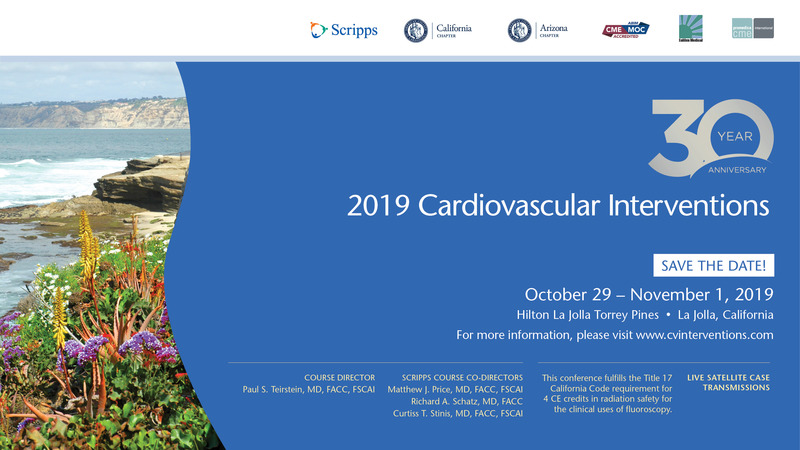 Join us to celebrate 30 remarkable years of interesting and complicated state-of-the-art live case transmissions and expert faculty contributions as we continue to explore the exciting future of interventional cardiology! The practice of medicine changes rapidly and the discipline of interventional cardiology changes dramatically each year. Changes in interventional cardiology directly impact patient care and require constant updates to physician knowledge and practices. The primary purpose of the “30th Annual Cardiovascular Interventions” symposium is to provide the practicing physician and cardiovascular care team with a concentrated exposure to new developments in interventional cardiology that will positively influence patient outcomes. By attending this program, participants will learn the latest advances and debates in interventional cardiology. They will return to their practice environment armed with the latest evidence-based, practical information to improve patient care and outcomes.